With the winter ski season underway, Luxury & Services turns its attention to the potentially hazardous issue of ski resort transfers. Especially on the often icy mountain roads, it is essential to ensure that your vehicle is as safe as possible in these conditions. Read about our selection of luxury 4x4s that will conquer the treacherous terrain. Rent a luxury 4x4 car on your ski holiday to give you more freedom and flexibility to make the most of the beautiful conditions in safety. It makes everything a little easier, from travelling to and from your chalet to exploring quieter slopes and even visiting nearby attractions at local resorts. But some cars perform much better than others on those tight and icy mountainous roads. Our fleet of 4x4’s are perfect for such conditions and are available for rent. They can be delivered anywhere in the Alps, including Chamonix, Megeve and Val d’Isere. But with so many options, which do you choose? The Range Rover Sport SVR is a proven performer that thrives in the harshest conditions. The muscular, broad car is home to many luxurious features alongside its 5L supercharged petrol engine, including an exceptional Meridian audio system, state-of-the-art navigation system and eight-inch touch screen. All of which combine to make this the epitome of driving comfort. The new Mercedes G63 Amg has a V8 twin-turbo engine that makes this car ideal for powering up those icy mountains, and its 480L boot means there is ample room for both skis and snowboards. But that doesn’t mean Mercedes have left out any comforts or mod-cons. Premium leather covers most surfaces and a Comand Online multimedia system with seven-inch colour screen will ensure you’re never stuck for entertainment. Similar to the G63, the Mercedes GLE is a brand new addition to our lineup. Its 4MATIC permanenet all-wheel drive continuously monitors traction to keep it gripping the road, no matter how icy it gets. It has a high viewpoint that gives the passengers an excellent view of the surrounding mountains and the driver a clear view of the road ahead. With a hybrid V6 engine and a suave, stylish interior, the GLE is perfect for both town and backcountry environments. 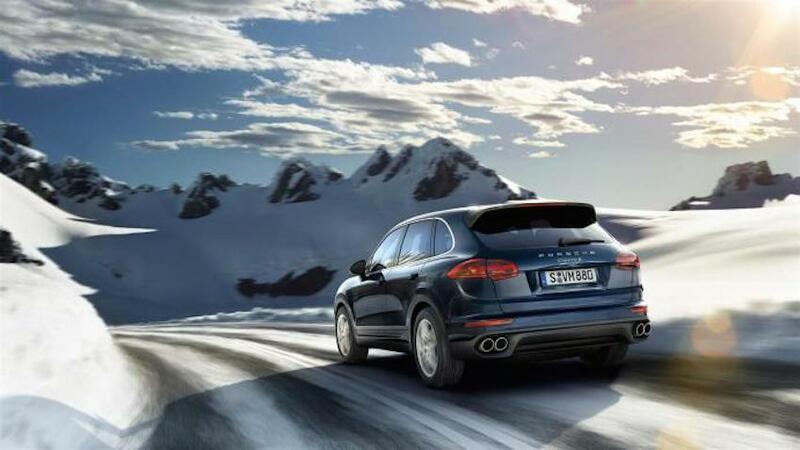 It would not be right to talk about cars suited for snowy conditions without mentioning the Porsche Cayenne Turbo. Despite its powerful 550bhp Turbo engine, the Cayenne isn’t without finesse. Passengers benefit from a vastly spacious cabin, as well as an advanced infotainment system that makes this one of the comfiest SUVs in the world. Whichever SUV you choose, we look forward to having the pleasure of welcoming you soon.